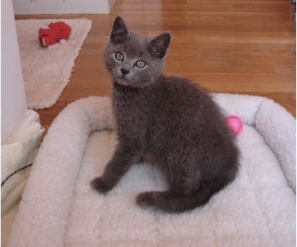 This week’s blog is one I wrote several years ago after Michael and I rescued a little gray cat from a local no-kill shelter. Actually, he rescued us, and you’ll hear about that story in my next book. He was a fluff ball of scraggly fur! From the day we brought him home, Poupon made it known he was a teacher in cat’s clothing. He often shows up “urting” at just the moment when one of us needs a good laugh. Or, when I’ve been working too long, Poupon will suddenly appear out of nowhere with his toy in his mouth, and paw at me until I give in, stop working, and play with him. Along with these gestures of love, there have also been several surprising moments when Poupon seems to remind us that there’s a greater force at work in our lives. One evening, during Michael’s illness, when we were both at our wit’s end, Poupon did something pretty unusual. We’d just gone to bed and I was doing my best to console Michael when we heard a thump. As we leaned over to see what happened, Poupon sat staring up at us with something at his feet. I looked down and gasped. Some time ago, I was given a gift – a polished blue stone in the shape of a heart, wrapped in a lacy bag of the same color. It was beautiful and I loved it so much that I placed it on the altar in the meditation area of our home – a place where we keep sacred and special objects. Much to our surprise, Poupon had climbed up on the altar, picked up the bag in his mouth, and carried it into our bedroom. He now sat on the floor next to Michael with the blue heart at his feet. Michael picked up the heart, put it in the bed between us, and we both fell asleep. The next day, we questioned the experience. Maybe it was just a coincidence. Was there really a message behind Poupon’s actions? He must have thought it was some kind of toy. It’s so easy to discount miracles, isn’t it? No sooner had we started questioning the experience when we decided to turn it around and question our skepticism instead. What if Poupon really did bring the little heart to Michael as a symbol that all will be well? What if he’s a soul, just like us, but dressed in a different type of body suit? ￼We decided to believe it was a sign that we were headed toward healing and I have no doubt that our decision paved the way for more miracles to come (which they did). Thanks to the lesson we’ve shared with Poupon, Michael and I have come to believe that our furry friends are little souls with big assignments. They teach us patience, the importance of play, and they foster unconditional love and compassion. I also believe they deliver messages from a realm we humans can’t yet see and today I pass Poupon’s message on to you. Think of this newsletter as a little blue heart wrapped in a lacy bag sent to you as a gift of comfort with the message that all will be well. Ok, off to play with our little guy, but before I go, I’d also like to put in a plug for rescuing angels – um, I mean animals. There’s a wonderful place in Cape Neddick, Maine (near York), called The Center for Wildlife that cares for injured birds and animals and returns them to the wild whenever possible. Here’s a video of ducks being prepared to go home. God bless these folks! You can watch it here.